[the] secret – one of the deep secrets of Life – [is] that all, that is really worth the doing, is what we do for others. Carroll’s life was one of generous kindness towards others, and even the book that made him famous, Alice’s Adventures in Wonderland, originated as an act of kindness – a tale told to entertain and bring joy to three sisters (among them Alice Liddell, the ‘real life’ inspiration behind Alice) during a boating trip one Summer’s day in Oxford. Carroll later painstakingly recorded (and reworked) the story, illustrated it in his own hand, and presented it as a gift to Alice Liddell. So it might have remained – an incredibly thoughtful and kind gift to bring joy to a single child’s life – had Carroll not been persuaded to publish it by the children of his good friend and fellow author George MacDonald. Since its publication, what began as a single act of kindness has brought joy to children and adults all over the world. But as Carroll and these other authors note, it doesn’t have to be grand acts of kindness – it is the small, everyday acts of kindness, compassion, empathy and love that count. These are things we can all do, and can all do more of. 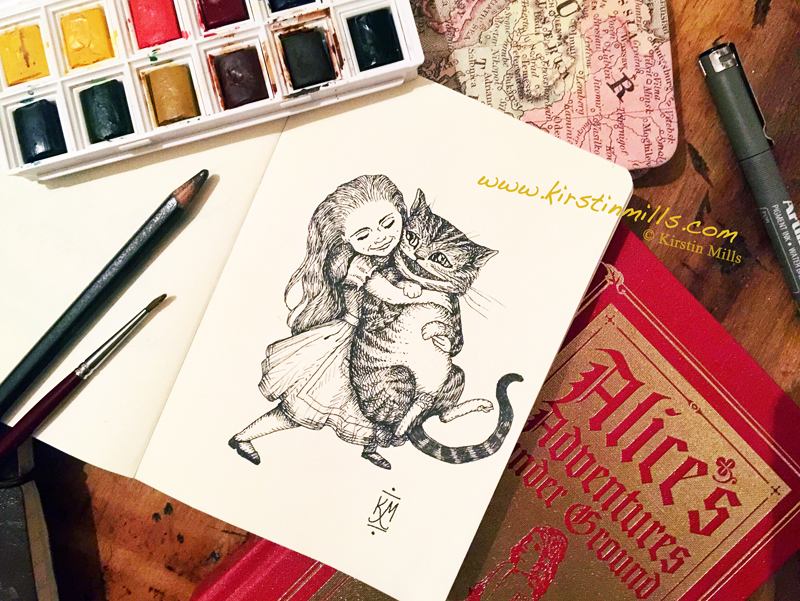 To celebrate World Kindness Day today, and to honour Lewis Carroll’s own timely words on the importance of kindness as “one of the deep secrets of life”, I decided to illustrate a moment of love and kindness between two of his most memorable characters: Alice and the Cheshire Cat. The Cheshire Cat in this illustration reminded me so much of my own mischievous and cuddly cat, and I think a lot of his personality has snuck in there too. I hope this image brings you joy, and that you remember to embrace kindness not only today but every day. Some believe it is only great power that can hold evil in check, but that is not what I have found. It is the small everyday deeds of ordinary folk that keep the darkness at bay. Small acts of kindness and love.